The first flags basic materials that can be used to introduce oneself to the subject matter or as handouts for public education. The second points to sources of more detailed and analysis for those who want to dig deeper. Here, to begin with, is the form you will need for tabling and other initiatives when collecting signatures for our Declaration of Voters’ Rights. Why not start by inviting your friends and neighbours to sign and be part of our movement. Click here for guidance on collecting and submitting signatures. Frequently Asked Questions is another Fair Vote Canada standby. This 6-page document addresses a wide range of questions and includes responses to the most commons myths about PR. A tri-fold gives people something more compact to take away while covering all the bases. Here’s a link to a generic tri-fold that you can use. However it is possible to design a similar tri-fold designed specifically for your own province or region such as the one on the right. You can see what has already been done in this vein in our Tri-folds folder on the Chapter Resources Google Drive. 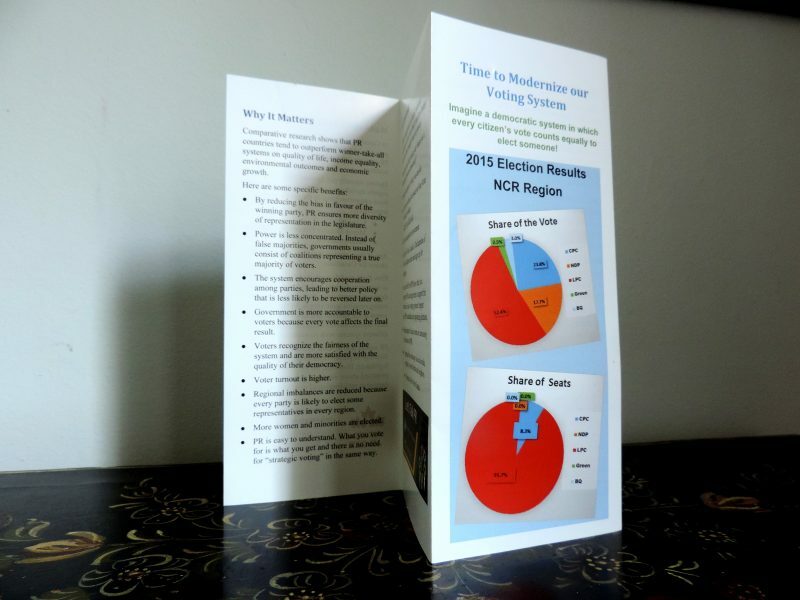 A geographically-specific tri-fold can be used to drive home a powerful message in regions that have been essentially swept by one party – of which there are many! Why Proportional Representation? A Look at the Evidence (9 pages), provides a review of the empirical evidence in favour of PR from around the world. The Case for Support is glossy handout filled with beautiful graphics that was developed for fundraising and as a lobbying handout with MPs in 2016. Commissions, Assemblies and Reports provides an overview of the multiple commissions, assemblies and reports on PR in Canada since 1923 and a useful riposte to those who call for us to be patient and not rush into reforming our electoral system! FVC also makes handouts to measure for specific campaigns. These additions to our inventory can later be customized for other campaigns such as the upcoming federal campaign in 2019 or other provincial campaigns. This link will take you to the principal resources developed for the BC referendum campaign in 2018, including postcards and flyers that could be customized for use in other provinces of for the upcoming federal campaign in 2019. In Québec, and more generally for French language material, consult the Mouvement démocratie nouvelle website, in particular, their Documentation page. The basic documents above are likely to more than suffice for most people, in addition to what can be found under the “What is PR?” tab of this website. That said, one reason that people turn to FVC is for our expertise on proportional representation and many of our members develop extensive expertise and research skills on PR over the years. Below are document and references that may be of special interest to the most dedicated FVC members and supporters. Commissions, Assemblies and Reports: Chronology and Highlights (unabridged) will help you appreciate the large body of work that has accumulated on PR over the years. This report includes basic on information on the principal electoral reform initiatives undertaken since 1923 and includes links to the reports that were produced when we could find them. Most of these reports are also available chronologically in our Google Drive folder on this subject. FVC’s brief to the Special Parliamentary Committee on Electoral Reform in 2016 and its 12 appendices was also intended as a general resource. This link provides easy access to each component of that submission. Simulations of a wide range of PR models for Canada are likely to interest may of our supporters. This link takes you to a Google Doc listing several tools worth exploring. We suggest you start with Byron Weber Becker’s simulations, listed at the top, which is the most comprehensive set of simulations currently available. Election results over the years make for great sleuthing about the distortions and oddities of FPTP. Here’s a collection of Google Sheets that bring together our work to date in bringing the data together in a visually convenient way. Wikipedia is a great source of additional information on individual elections and in all of these tables, there are Wikipedia links attached to the date of each election in the tables. 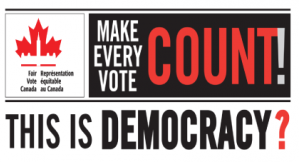 The Alternative Vote (or Instant Runoff Voting): It’s No Solution For the Democratic Deficit (4 pages) will help you to understand that perennial rival of PR, the Alternative Vote, as a solution to Canada’s democratic deficit. This document outlines Fair Vote Canada’s position on ranked ballot in single member ridings established in August 2009. For a more recent take on the issue, see Briefing Note On AV Messaging for Those Who Believe in PR (2015). OpaVote Website for running ranked-choice voting elections. ACE Electoral Knowledge Network has an amazing amount of information on electoral systems in different countries. Look under the Comparative data tab, which includes the graphic shown above. From there, you can use the drop-down menu to find information on individual countries. Proportional Representation in World’s 35 Most Robust Democracies. Election results by year for other countries (so far only Ireland, New Zealand and Netherlands). 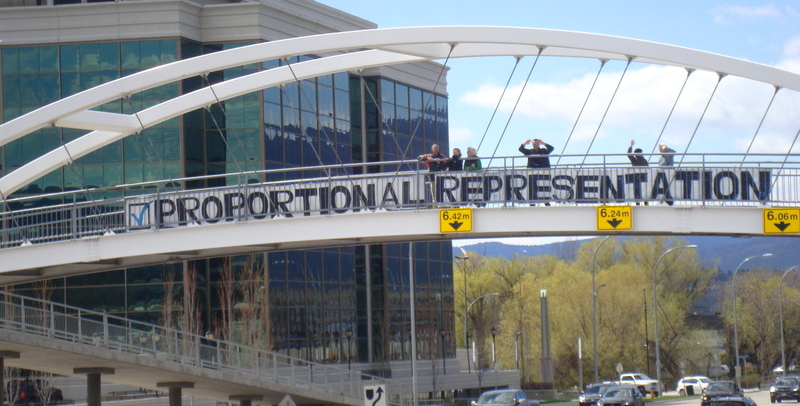 Fair Vote Canada’s “Why Proportional Representation? A Look at the Evidence,” which we are updating from time to time, provides a relatively thorough and concise review of comparative research from around the world with citations of key references. Sightline Institute is a US-based research institute with a strong interest in what is happening in Canada. It’s website is very rich. You can browse through its Democracy program or go directly to Archaic Election Methods Cripple Democracy, and from there to Glossary of Methods for Electing Legislative Bodies (2017-05-18). which provides a very comprehensive summary of options and the advantages and disadvantages of each.